We’re all faced with dilemmas, aren’t we? 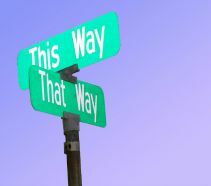 Decisions… decisions… big decisions or small ones – they all can have enormous consequences in our lives. So we want to make the RIGHT decision…every time. In Luke 14:28-30, Jesus tells about a man who wanted to build a tower. Jesus said he should first sit down and estimate how much it would cost him so he could determine if it was going to be a success. In other words: think it through. Don’t go off half-cocked. Don’t make spur of the moment decisions based on your emotions. That’s a mighty dangerous thing to do. When we’re ‘hasty, we can miss the way,’ which is exactly what Proverbs 19:2 says not to do. Randy has just been offered a new job with a lot more opportunity for advancement than his present job. He and his wife Sherry don’t know what to do. They are Christians and want God’s will in their lives. But how do they figure out what that is in this situation? They can’t think of any Bible verses that say, “Thou shalt…or shalt not…accept this job offer.” What a dilemma! So, what should they do? We’ve been at this decision-making thing for a long time. Some decisions have been good – some not so good – some downright devastating. We knew we needed help! (They say that’s the first step.) So through the years, we have come up with a decision making process we call the COW LIPS Solution. Yeah, we know it doesn’t sound very spiritual. But read on…it is very spiritual! COW LIPS is an acrostic. (That’s a relief, huh? Bet you were coming up with visions of mysterious lip-smackin’ cows, weren’t you?) Yes, the acrostic is strange, but memorable. Each letter stands for something very important in our “estimating the cost” and thinking through a decision. Each one is important, although they are not listed in order of their importance. C – Commands – Are there any commands in Scripture that apply to this decision? O – Other Believers – What advice do other believers have about the situation? W –Word – What does God’s Word have to say about your decision? L – Logic – What makes sense – or doesn’t make sense – about the situation? I – Impressions in Prayer – Pray consistently for God’s guidance. And then listen. He just might impress you with some truth while you are praying. P – Promises – Are there some promises in Scripture that you can claim concerning your decision? S – Situations/Circumstances – What are the current circumstances that define your situation? What additional circumstances happen during the decision making process? 1. Give yourself time to make the right decision. If possible, at least two weeks. 2. If possible get into Scripture every day as a couple. 3. Make sure you don’t play “skip-to-my-loo” with Scripture. No fair looking for proof texts to get permission to do what you wanted to do in the first place. Stay in the Scripture text where you are already reading. If you have not been reading the Bible together as a couple, now is the time to start. Choose an Old Testament and a New Testament book to read in every day, and stick with them until God gives you His answer. 5. Write every “Ah-Ha” down. Every time you come to a C, O, W, L, I, P or S, write it down. It’s best to use a notebook or tablet exclusively for this purpose – this is your Discovery Notebook. Write out the Scripture verse, the impression, input from another believer – whatever – and beside it, mark it with the letter that designates what it is (C-O-W L-I-P-S). 6. When you have filled a few pages, make a T-Square page. “CONS.” Write down each of your discoveries on one side or the other. Each discovery will either be a reason for (PRO) or against (CON) the option you’re trying to decide about. The W’s, P’s and C’s weigh the heaviest, next are the O’s and I’s, then the S’s and L’s. Let’s flesh this out by returning to Randy and Sherry and the decision they face: Should they take the job offer or stay where they are? There are a few other considerations about their situation you need to know. 1) The job referral came from a long-time Christian friend who also works at the new company. 2) The new job is 500 miles from where they live now. 3) They presently live near Sherry’s parents. 4) The friend who recommended Randy is helping plant a new church in that area, and encourages Randy and Sherry to come help lead small home groups. 5) The new job would start at the same salary level Randy is at now, but has plenty of room for advancement. 6) Randy has been feeling rather stifled at his present job for some time. These are all S’s that Randy and Sherry will put in their Discovery Notebook and later on the T-Square. Randy and Sherry have been reading the Bible together for the last few months. They are in Genesis 12 and John 14. As they read now, they have a new excitement, expecting God to speak to them through His Word. (What a concept!) What’s this…right in verse 1 of Genesis 12? Leave your country, your people and your father’s household and go to the land I will show you. Wow! Guess they can stop reading, huh? No. This was God speaking to Abram – and it might be God speaking to Randy and Sherry, but they have to keep reading until they know for sure. However, Genesis 1:18 certainly gets copied into their Discovery Notebook with a W beside it. In Genesis 13:2 and 14:19-20, they also discover that God blessed Abram a lot because he obeyed Him. So these verses also go into their notebook. In John 14:27, they find a wonderful promise that certainly applies to their situation: Peace I leave with you: my peace I give you. I do not give to you as the world gives. Do not let your hearts be troubled and do not be afraid. This P is especially meaningful to them, for even the possibility of stepping out into such an adventure is very frightening to them both. The very first Sunday after they start using the COW LIPS Solution, their pastor preaches on Acts 18. He speaks about a couple named Aquila and Priscilla and how they left their home in Corinth to go with Paul to start a church in Ephesus, which met in their home. As soon as they get home, they transfer their sermon notes into their Discovery Notebook with a W and an O beside them. During the next week and a half, they talk several times with their Christian friend at the other company who excitedly shares with them how God is blessing the new church plant, and encourages them to consider how God could use their experience in leading small groups in this new work. They also seek advice from their pastor and Sherry’s family. After two weeks, they have filled five pages in their discovery notebook. Five pages filled with Scriptural Commands, Other Believers’ advice, verse upon verse from the Word, Logical observations, Impressions they received while praying, Promises they had found in their Scripture reading, and the Circumstances of their Situation. As they copy their discoveries onto the T-Square, they see a pattern forming. The great majority of all the C-O-W L-I-P-S are on the PRO side for taking the new job. There are only five discoveries on the CON side: two L’s, two S’s and one O.
Randy and Sherry had sat down, estimated the cost, and took the time and effort to seek the Lord with their whole hearts. They didn’t go off half-cocked, they didn’t make a spur of the moment decision. They didn’t base their decision on their feelings. They can make their decision with confidence and peace. And later, when the devil throws in some doubts and second-guessing, they can pull out their Discovery Notebook and remind each other that their decision was a COW LIPS Solution.